Home > Blog > Social Network Analysis Is Helping Us Regreen Rwanda. It Can Inform Your Environmental Work, Too. On February 21st, 2003, Dr. Liu Jianlun, seized by a coughing fit, took the elevator in Hong Kong's Metropole Hotel to his room on the ninth floor. Johnny Chen, a Chinese-American resident of Shanghai, was staying across the hall. Chen traveled to Hanoi, fell ill, and five days later, was admitted to the hospital. By July, the disease had spread globally, with 25,000 residents of Toronto, Canada in quarantine. The 2003 outbreak of Severe Acute Respiratory Syndrome (SARS) killed 774 people, and 8,000 more were infected. But thanks to social network analysis—a study of social structures using relationship-based network graphs—the World Health Organization's rapid response team traced back the spread of the disease from Canada to Hanoi to Hong Kong. Social network analysis led them to one of the central transmitters: the ninth floor elevator button of the Metropole Hotel. By finding the transmission sources, health officials were able to trace how the disease evolved, understand the probable cause, and take preventative measures to prevent future crises. Social network analysis is used by public health officials to pinpoint vectors of disease, and by national security agencies to identify leaders of illegal organizations. These are crisis disciplines with a focus on quickly saving lives—and they must understand how people network to do so. In a way, environmental conservation is also a crisis discipline, tasked with urgently protecting and managing nature to provide essential services like food and water. It, too, can use social network analysis to inform interventions. Restoration is most successful when it is designed to meet the needs and aspirations of local people. Farmers in hilly Rwanda have long suffered from the ravages of soil erosion, which carries away precious topsoil and nutrients, but can be halted by the binding roots of trees. In our interviews, the farmers were vocal about wanting to conserve their soil by planting two types of trees in particular: fruit trees to supplement their diets and income, and indigenous seedlings that can be used in traditional medicine. But, when we asked farmers in Rwanda's Gatsibo district why they have not planted more trees already, they said it has not been easy for them to find the seedlings that they want. Using social network analysis, we mapped out the nearly two dozen organizations that have been providing seedlings to Rwandan farmers for nearly 40 years, from NGOs like One Acre Fund (Tubura) to massive Ministry of Agriculture projects like Land Husbandry, Water Harvesting and Hillside Irrigation (LWH-RSSP). The social network graph below, created through our conversations with farmers and other local stakeholders, codes the different stakeholder groups by color. 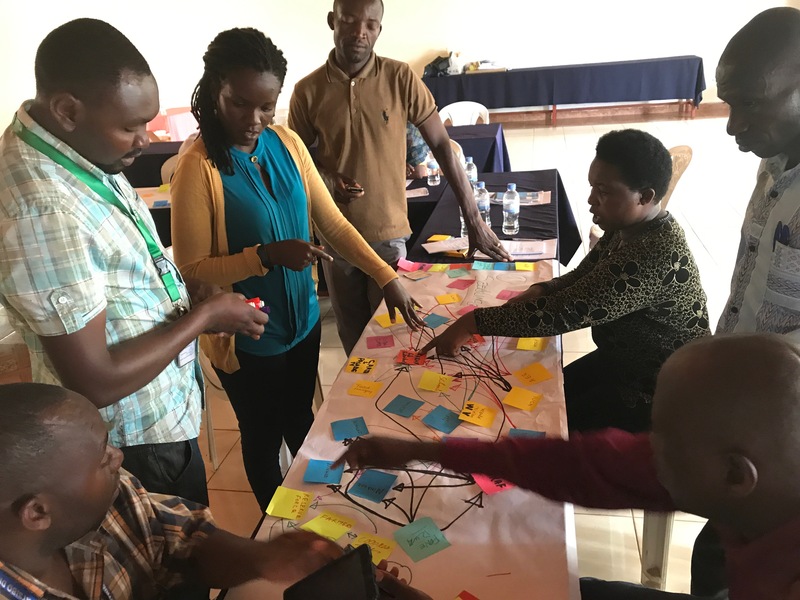 What surprised us was the emergence of three distinct clusters—NGOs, government and entrepreneurs—that are all working to regreen Rwanda, but according to the network analysis, often don't build on each other's work, and sometimes even hinder each other. A line between groups signifies a seed or seedling exchange, either free or purchased. The graph places local farmers (the largest circle) at the center of the seedling trade, exchanging with many other community groups and NGOs. 1. NGOs provide a variety of seedling sources but don't offer continuity or choice: Many NGOs and local community institutions do not provide seedlings to farmers in one area for the long term, due to shifting priorities, project timelines and funding flows. So farmers build relationships with many NGOs to buffer against the whims of individual organizations. If one source stops providing a species or a project ends, farmers can fall back on their network to find seedlings elsewhere. The problem, however, is that this broad network of NGOs and community institutions doesn't always have the seedlings farmers want, and farmers don't usually get to choose which species are in the assortment of discounted or free seedlings offered. 2. Farmers lack direct access to formal channels to acquire seeds: Rwanda's national Tree Seed Center provides a variety of seedlings, including the types that most farmers want, but farmers cannot buy seeds directly from them without a hard-to-acquire certificate. As a result, most farmers go through the Gatsibo District government or the NGOs that run nurseries with seeds from the Tree Seed Center. The drawback is that local governments and NGOs tend to choose species from the Tree Seed Center that fare well in bulk, are easiest to transport and are less expensive to grow. This limitation often results in a glut of timber trees, but none of the indigenous or fruit species that farmers want the most. Worst of all, a farmer might live in an area without a local NGO presence, and have no easy access to seedlings at all. 3. Entrepreneurial activity is limited by an aid-driven economy : Private businesses also sell seedlings, but few of them sell directly to small farmers. Instead, they target their sales at the relatively larger NGOs and government institutions, which in turn give the seedlings free or at a discount to farmers. This aid-driven model means that private seedling sellers also rarely grow the types of seedlings that farmers may want the most, instead selling the hardy, low-cost species favored by the intermediaries. This graph shows how farmers connect to other local stakeholders. Hover over each bubble to learn more. What does social network analysis say about how to address these challenges and get Rwandan farmers the seedlings that they want? Importantly, the analysis allowed us to understand how the seedling network operates in Gatsibo and diagnose its problems. It revealed that the problems are largely rooted in miscommunication about farmer seedling demand and highlighted the question as to whether or not that should drive priorities for NGOs, the government and seedling-selling entrepreneurs. In fact, we may already be seeing signs of progress because of the analysis. Doing social landscape analysis often involves assembling many of the stakeholders together in a room to map out relationships and flows of information. In the Gatsibo case, this jumpstarted several useful conversations between farmer groups, NGOs and the local government. There is much more to do, but the process has started. The Mapping Social Landscapes guidebook approaches environmental problems from a new angle: mapping the people who live, work, and depend on the landscape. It can be used not just to map seed networks, but to improve governance in sensitive areas such as national parks or to address inequalities in the regulation of small-scale fisheries. Environmental concerns may not always seem as cinematic as crises like pandemics and national security emergencies. But they will determine our future safety and prosperity just the same. Understanding the social landscape allows us to build stronger and more sustainable environmental movements. Visit the guide to begin mapping your social landscape! Participants identified names and coded institutions based on their knowledge and how they perceived institutions. All social network analysis maps are made with kumu.io.